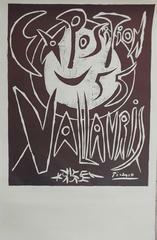 An original signed lithograph on Arches wove paper by Spanish artist Pablo Picasso (1881-1973) titled "Le Vieux Roi (The Old King)", 1959. Hand signed by Picasso in blue crayon lower right and pencil numbered lower left. Limited edition: 120/200. (There was also an unsigned edition of 1,000 on Mourlot watermarked lighter Arches paper). Printed by Atelier Mourlot, Paris, France and published by 'Le Patriote', Nice, France in 1959. Arches block watermark right center margin. Reference: (Bloch 869; Mourlot 317; Reuße 748). Provenance: Estate of Peter Knoll - New York, NY. Sheet size: 30.25" x 22". Image size: 25.5" x 19.5". In excellent condition. Rare. In the aftermath of the Second World War, Picasso joined the communist party and was active in promoting its activities through his art. The newspaper 'Le Patriot' was a supporter of this ideology and Picasso made a number of lithographs and linocuts which were published by the newspaper including this work "Le Vieux Roi (The Old King)". It was sold to raise funds for the communist party. Pablo Picasso was born on October 25, 1881, in Málaga, Spain. 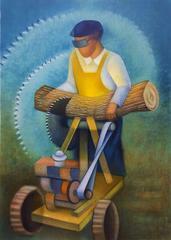 The son of an academic painter, José Ruiz Blasco, he began to draw at an early age. In 1895 the family moved to Barcelona, and Picasso studied there at La Lonja, the academy of fine arts. His visit to Horta de Ebro from 1898 to 1899 and his association with the group at the café Els Quatre Gats in about 1899 were crucial to his early artistic development. Picasso’s first exhibition took place in Barcelona in 1900, and that fall he went to Paris for the first of several stays during the early years of the century. Picasso settled in Paris in April 1904, and his circle of friends soon included Guillaume Apollinaire, Max Jacob, Gertrude and Leo Stein, as well as two dealers, Ambroise Vollard and Berthe Weill. His style developed from the Blue Period (1901–04) to the Rose Period (1905) to the pivotal work Les Demoiselles d’Avignon (1907), and the subsequent evolution of Cubism from an Analytic phase (ca. 1908–11) to its Synthetic phase (beginning in 1912–13). Picasso’s collaboration on ballet and theatrical productions began in 1916. Soon thereafter, his work was characterized by neoclassicism and a renewed interest in drawing and figural representation. In the 1920s the artist and his wife, Olga (whom he had married in 1918), continued to live in Paris, to travel frequently, and to spend their summers at the beach. From 1925 to the 1930s Picasso was involved to a certain degree with the Surrealists, and from the fall of 1931 he was especially interested in making sculpture. In 1932, with large exhibitions at the Galeries Georges Petit, Paris, and the Kunsthaus Zürich, and the publication of the first volume of Christian Zervos’s catalogue raisonné, Picasso’s fame increased markedly. By 1936 the Spanish Civil War had profoundly affected Picasso, the expression of which culminated in his painting Guernica (1937, Museo Nacional Centro de Arte Reina Sofía, Madrid). Picasso’s association with the Communist Party began in 1944. From the late 1940s he lived in the south of France. Among the enormous number of exhibitions that were held during the artist’s lifetime, those at the Museum of Modern Art, New York, in 1939 and the Musée des Arts Décoratifs, Paris, in 1955 were most significant. 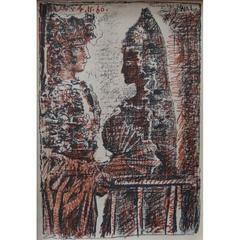 In 1961 the artist married Jacqueline Roque, and they moved to Mougins. There Picasso continued his prolific work in painting, drawing, prints, ceramics, and sculpture until his death on April 8, 1973. 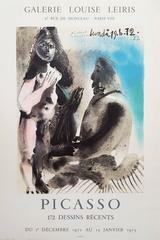 Important lithograph poster by Picasso for the Galerie la Colombe in Vallauris. The famous Picasso's dove is there to underpoint the name of the gallery. dated 1961 and framed.